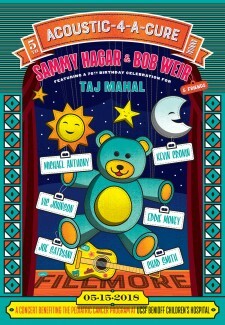 Solo w/ Bob Weir, Taj Mahal, Michael Anthony, Vic Johnson, Eddie Money, Joe Satrani, Chad Smith. SAN FRANCISCO, March 26, 2018 - Bay area music legends Sammy Hagar and Bob Weir are joining forces for the fifth annual "Acoustic-4-A-Cure" benefit concert on May 15 at The Fillmore in San Francisco. 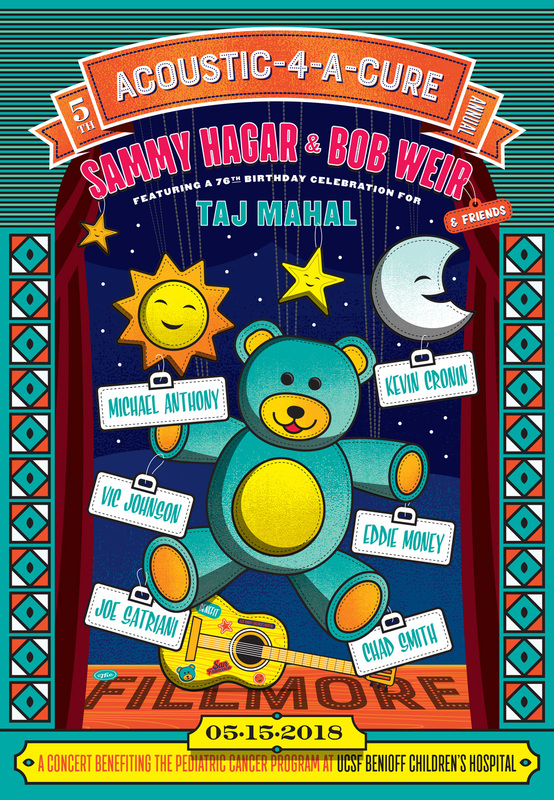 Acoustic-4-A-Cure V will be a special 75th birthday celebration for blues icon Taj Mahal, with artists including Joe Satriani, Chad Smith, Michael Anthony, Kevin Cronin, Eddie Money and Vic Johnson already confirmed to perform. The 2018 concert blends veterans and newcomers to the event, with Bob Weir stepping in to co-host the concert which benefits The Pediatric Cancer Program at UCSF's Benioff Children's Hospital. "I was a fan of Taj Mahal long before I had a record deal in Montrose 1973," said Sammy Hagar. "He's become a dear friend over the years and without a doubt, is one of the few living blues legend left on this planet!!! Having Bob Weir, being on the same page, understanding how important and how much fun this will be much less with a bunch of great artist, for a good cause!!!! It doesn't get any better than this annual event." Tickets will go on sale Friday, March 30 at 10AM PDT via www.livenation.com. Tickets will not be available at The Fillmore box office, charge by phone or outlets. Now in its fifth year, Acoustic-4-A-Cure has quickly become one of the Bay Area's hottest tickets, with legendary artists performing acoustic sets, epic collaborations and impromptu jams from intimate and equally legendary San Francisco venues like The Fillmore. The benefit was created by Bay Area rock legends Sammy Hagar and James Hetfield, who co-hosted the first three years, who envisioned throwing a straight-up must-see rock concert for fans and donating the proceeds to The Pediatric Cancer Program at UCSF's Benioff Children's Hospital. Artists including Dave Grohl, John Mayer, Sarah McLachlan, Billie Joe Armstrong, Jerry Cantrell, Linda Perry, Chad Smith, Melissa Etheridge, Pat Benatar & Neil Giraldo, Joe Satriani, Pat Monahan, Adam Sandler, Nancy Wilson, Vic Johnson, Tommy Lee, Kris Kristofferson and more have performed at the sold-out shows. PLEASE NOTE: In an effort to make sure that fans get the best tickets, this concert is a "will call only" event. Doors open at 6:30 PM and the concert begins promptly at 8:00 PM so we encourage guests to arrive early. All ticket orders over the 2-ticket limit will be subject to cancellation without notice. This includes duplicate orders having the same name, billing address, or credit card. Each customer will need to bring their government issued photo ID and credit card used to purchase the tickets to the box office window on day of show to redeem the tickets. Once the ticket order is redeemed the customer must directly enter The Fillmore. All will call tickets must be picked up by the card holder. Alternate names for Will Call will not be permitted. You cannot leave tickets at will call to be picked up by someone else. No "drop-offs." Live Nation will cancel any and all orders without notice that exceed the ticket limit.